Mesh V-neck dress with long lace jacket available at Yourday Bridal. Size 38 - 40. Colours in stock Soft blue, wine, navy, magenta. 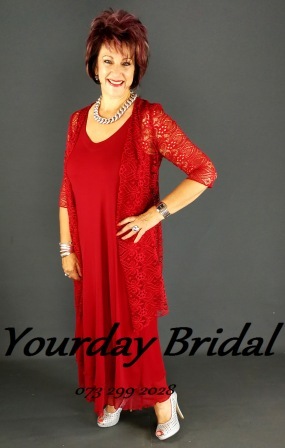 Lovely Mother of the bride or groom dresses and pant suits available at Yourday Bridal. 104 Willem Botha Street, Eldoraigne, Centurion. Contact us for an appointment at 012 653 0318 or 073 299 2028. Hours Monday to Friday 8.30 to 4.30, Saturday 9 to 12. Please note we work on appointment.